A 10th place finish in the C Feature at the 2016 Racesaver IMCA Sprint Nationals didn’t set well with 42-year old Robert Vetter of Wolf City, Texas; so he is chomping at the bit to return to Eagle Raceway to try again. Let’s get to know him a little better. Q: How did you get your start in racing? Robert: I started racing motorcycles when I was 21 or so, but I was into bull riding, so I did more of that than racing. Then I went to racing cars about 12 years ago. I started in a Pinto, which is a mini-stock in Texas. Then I went to a bomber, then a street stock where I won a bunch of races. Then it was limited modifieds, and I won a bunch of races in those. Then 5 years ago I moved up to a sprint car; then I sold everything else and stuck with the sprint car. Q: Were the sprint cars 360’s? Robert: No, they were the Racesavers. To me, it was affordability. Actually, I found a guy who wanted to do some trading on a roller sprint car for a limited modified. So, that kind of got my foot in the door. I didn’t know anything about sprint cars. I bought a bunch of parts on E-bay, injectors and all kinds of stuff. Jimmy Allard built my first ever sprint car motor. I put it in and it lasted 5 years until last year before it ever broke. Q: So, why did you decide to run a Racesaver sprint? gotten so crazy on pricing. The sprint cars can as well, but a low-budget team like mine can win races with talent, not just money. Q: What tracks do you run at down there? Robert: My primary track is Friday night at RPM Speedway, and on Saturday night it’s Devil’s Bowl Speedway. Then when we rain out I run everywhere; all of the tracks in the Dallas area. Last year I made several trips to Amarillo. 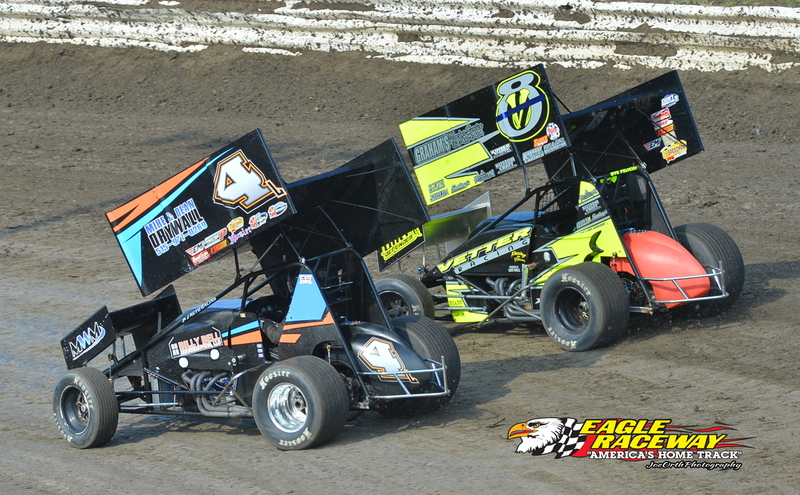 We raced a little bit in Oklahoma with the Southern Oklahoma Sprint Car Series, and we made our first trip ever to Eagle Raceway for the Nationals. Q: So; this was your first trip to the Nationals then? Robert: Yes. I always wanted to go, but with job stuff, I could never really afford to go or had the time to go. I thought it was a big money pit to go. 2 years ago diesel was over $4 a gallon, so I figured I couldn’t afford it because we couldn’t afford the diesel. So last year I saved up some money and said “I don’t care how much it costs, I’m going!”. And it was amazing to me that it wasn’t a rip-off; it was a good deal for the racers. You know, a lot of the stuff that we go to that they call ‘Big Shows’ with big money, there’s not a lot of big money but a little bit of big money. They up-charge for everything and with entry fees it gets very expensive if you don’t watch what you’re doing. But the event you ran up there was just amazing! We went there with a little bit of money, and left with about the same amount; we really didn’t spend much. With no entry fees, what we won every night kept us going. It was pretty awesome. Q: What did you think of Eagle Raceway? the wall like they do. The facility is awesome. We had a good parking spot on the back stretch with a concrete pad; once again that was free which was awesome. Everything was great; even the weather was great last year. I saw monsoons happened the year before. We had a little bad experience with the law down there, but other than that it was a great experience. I travel with guns in my truck, and apparently that’s a problem; but, we got it all worked out, so no problem. Q: You finished mid-pack in the C Feature on Sunday, right? Robert: Yeah. How we drew put me back in the field every race, so every night we were in the C Feature. We struggled with gearing. Having never been there, I tried to put a gear in my car to go but it didn’t work; so, I put gears in for momentum and I couldn’t get the momentum right either. We had a starting point, but a lot of it was that we had a brand new motor in the car. We blew a motor the Saturday before, and my motor guy put me a motor together. So we put a new motor in the car and it really wasn’t broken in. The following week we ran it down here and I ran second. As the weekend at the Nationals went on, it opened up. I was struggling to learn the track a little bit, and we were trying to find the right gear for the track. Q: So, you like the Racesaver class? Robert: Absolutely! I mean, don’t get me wrong, I’m sure a 360 would be fast, but you’re not going to find this kind of car count and the kind of tracks that run weekly unless you’re in a Racesaver sprint car. There’s weekly shows in Texas, tons of them! But with the 360’s and 410’s, they’re their own group. They might have a big show here and there with a lot of cars, but week to week races, this is the best class there is. Affordability; I’ve got $6,000 in my motor and we run up front down here. I won the state championship and the track championship down here last year and we got 7th in the nation in my first year of chasing points; all with a very low budget. My frame was a 1990 California non-wing car, and we made it a winged car. We did very well chasing the points this year. I think that the Racesaver class is awesome for a novice driver to someone that has an unlimited budget. Q: What about the Racesaver rules? Robert: I absolutely like them. I wish there was something to keep the cost down a little bit more. Where guys like me think that if some guy didn’t have a $15,000 motor, he wouldn’t be so good. I’m sorry to say that if you have the very best parts, it does make a little difference. Some of the shock packages are getting a little crazy; if they could take some of that stuff out of the equation, that would be pretty cool. I do like what they’ve done with the tire specs. I wish they’d take some of the injector rules out; like putting everybody on a 2 3/16” Hillborn instead of these $6,000 injectors. It doesn’t matter what class you’re in, people are going to abuse the money situation and get the high dollar stuff whether it matters or not. If they would monitor the injector stuff a little more, I think that would maybe get the horsepower a little bit more even. My motor that we ran for 5 years, twice a week had hundreds of nights on it. It had 386 horsepower and it cost like $3,600. It just ran good. We won some races on big heavy race tracks, and we won some on dry-slick tracks. So, I’m a big fan of the class and the rules. For a guy like me, I can’t win every night with that kind of motor, but I can win quite a bit. I won 2 championships with that motor. So, it can be done. Q: What’s it like racing against people from all over the country? Robert: Great! I’m looking forward to this year. My parents still live in Bakersfield, California and we’re going to make a trip down there. And this was the best thing about the Nationals last year; I met Monte Ferrera and a couple of other guys down there, like the number 17. He’s a big shot out in California. We’re going to go out there this year and support some of their tracks and see my family. And he’s going to come down here and run a couple of Texas tracks with us. Just me showing up at the Nationals introduced me to a few people that I never would have met from where I used to live, and now we’re going out there to get together and they’re going to come down here to race on the way to Nebraska. It became a really cool bond just because of the Nationals. Everything that you all said it was, it was! I didn’t see any fighting; it was just a pretty cool week in general. When you have that many cars together for a week, if you were in a door car there would be all kinds if fights and brawls for 5 days. But with the Nationals everybody just raced hard, if you crashed you fixed it, and people helped you fix it. There was some guy from Canada on one side of me and on the other side was some guy from California; it was great! I’m not just talking you up; we’re coming back. Q: You didn’t get into the Sunday A Feature, but what did you think of the 3-wide start? Robert: It’s amazing! Since I raced stock cars for several years, I went to Boone, Iowa and was involved in a 3-wide start. They also do it here at Texas Motor Speedway at the dirt track where I raced my modified. Two years ago there, I started outside front row for a 3-wide start. Some people say it’s crazy, but I like it. It’s not crazy; we know what we’re doing. Make it 4-wide, I don’t care. I want 40 cars doing it. I think it’s great; it’s great for the fans. The fireworks that you put on before the race, the announcing the drivers before the A Feature; I was mad because I didn’t make it honestly. I was like “Dude! I’m doing good in National points and leading all of my track stuff down here”. We really wanted to get to the A main, but we just didn’t. We’re parked in the C Main, and I won 2 championships! So, that shows how tough the competition is. Q: Can you think of anything that we haven’t talked about that you want the fans and drivers who haven’t come to the Nationals yet to know? Robert: If they think it’s a money pit to get into, it’s not! Free pit stalls, the pit passes were just $25, it’s actually cheaper to run the Nationals than my regular Saturday night show. You’re paying your fuel to get there, and your motel, but the rest of it is amazing. It doesn’t cost a fortune to run there. Every night, whether we ran good or not, we got money back. And that’s what it’s about; getting the low-budget guys there. If it was a big entry fee, and big pit passes, I wouldn’t go. So I think that what you guys are doing is a great contribution to the class. “Let’s have a big show, but we’re going to charge a weekly rate with no entry fee”. We race down here for less money but pay entry fees. I went all the way to the Nationals, raced for 5 days and came home with as much money in my pocket as I left with. That’s because what I spent for my fuel and motels, I got back with all of the money that I made all week. I had a great time, and can’t wait to come back.